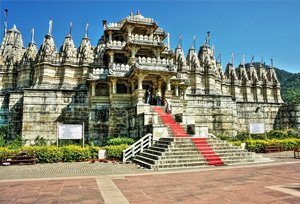 The Jain temple of Ranakpur is situated in the heart of the Aravalli hills. The temple is a fine specimen of art and culture that makes it a treasured site of Rajasthan that is to be cherished. The construction of this temple was started in the year of 1446 and was completed in the year 1496. It took fifty years for the completion of the temple. It is a three-storey building made up of marble. The structure of the temple consists of four entrances. The main chamber of the temple contains four images of Adinath. The images are sculpted out of white marble and each are around seventy two inches tall and are built in such a way that one image is situated in each direction. Therefore, this temple is also known as Chaturmukh Jain temple. Apart from this, there are seventy six small in size domed shrines, four assembly halls, four principle shrines situated in the four directions along with many subsidiary shrines. There are four unique Meghananda Mandapa that have elegant designs. The pillars are of forty feet height with delicate carvings all around. Giving support to magnificent domes with studded. Precious stones, these pillars make one of the main attractions in the temple. The domes also hold radiant images of the Gods and Goddesses. On the west side of the Meghananda Mandapa is situated the images of Dharanashah, who was the initiator of this temple and of Deepak who designed this temple, both facing the image of the Lord. The incredible part of this temple is the multiple number of pillars situated all around the temple. These pillars are unique in nature some being big, some small, some ornate while others are plain. This structure shows the art and skill of the indigenous designer who has given the artistic touch to the Ranakpur Jain Temple.